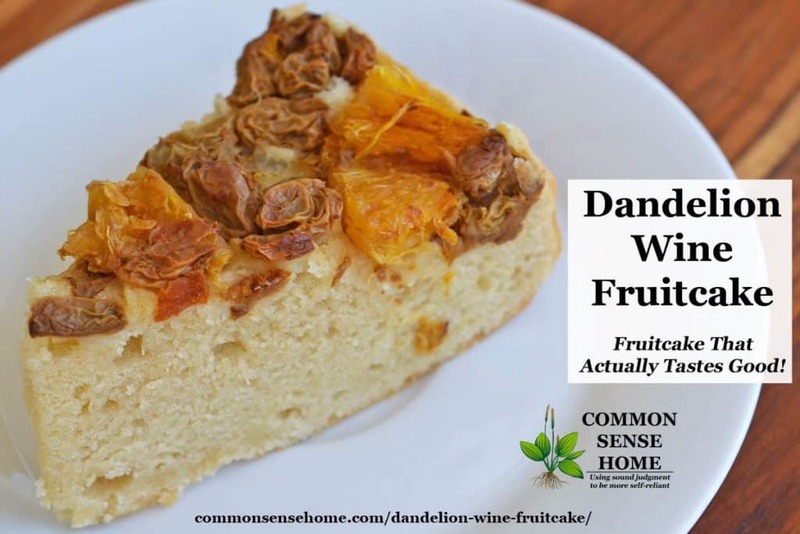 Dandelion Wine Fruitcake - Fruitcake That Actually Tastes Good! You are here: Home / Recipes / Dandelion Wine Fruitcake – Fruitcake That Actually Tastes Good! First, if you want to try this recipe, you need to make a batch of homemade dandelion wine. (Fruit strained from other homemade wine making forays is likely to work, too.) When you strain the fruit out of the wine, set it aside for this recipe. It'll keep easily in the refrigerator for several weeks, if needed, because of the alcohol content. Think along the lines of “brandied cherries”, except in this case we have a wine soaked citrus and raisin medley. 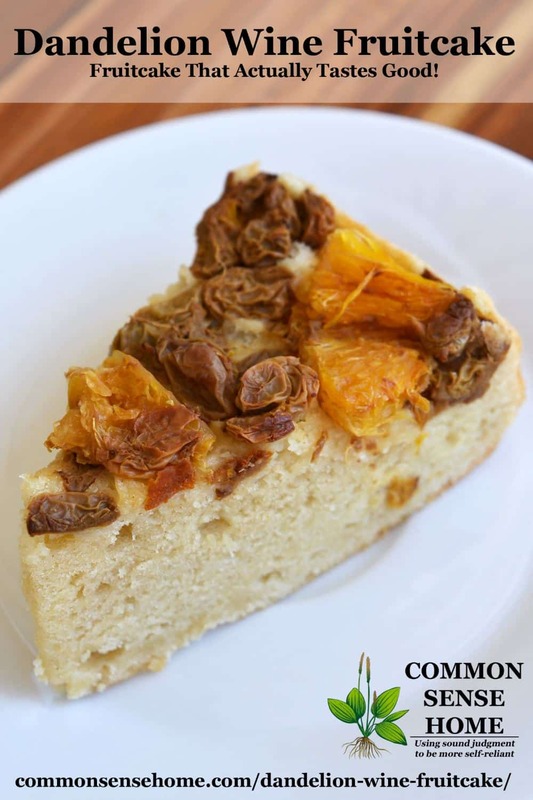 So, without further ado – dandelion wine fruitcake. Preheat oven to 350F. Prepare a nine inch round, nine inch square or 11×7 pan by greasing, flouring and putting a piece of parchment paper in the bottom. Spread fruit mash into bottom of pan. In a medium bowl, cream together butter and sugar. Mix in egg, vanilla and lemon extract (if desired). 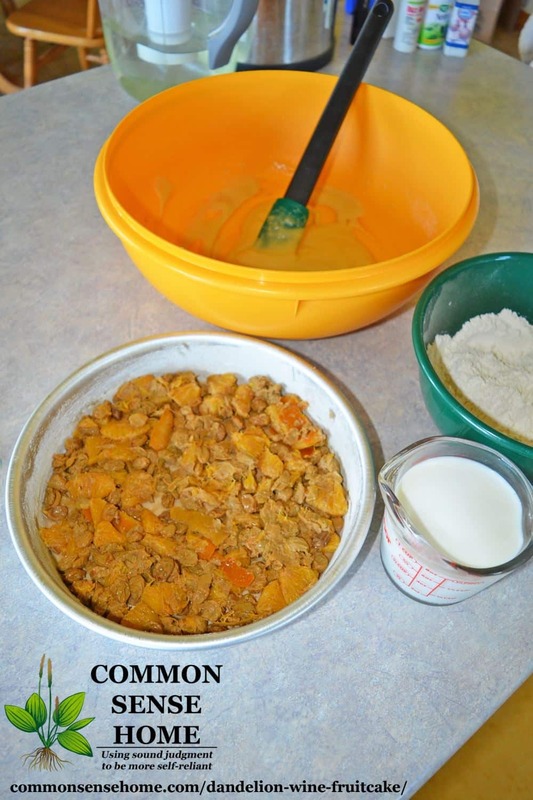 Mix flour, salt and baking powder in a small bowl. Add dry ingredients to butter mix, alternating with milk, stirring well after each addition, until all ingredients have been added to the batter. Remove from oven and invert onto serving platter. Serve warm or at room temp. Refrigerate leftovers for up to one week. A fun and easy way to use up the leftover fruit mash from homemade wine making. Looks more like a cheesecake! Do the raisins float to the top? The fruit stays in a layer at the bottom of the cake. Ah and you have flipped it over! Genius. Off to make it right now. Thanks for the link. Like a pineapple upside-down cake – yep!